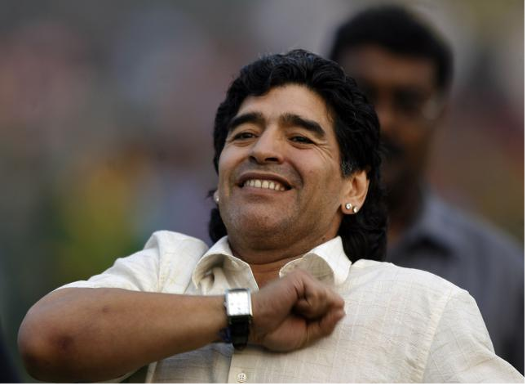 Football legend Diego Maradona is set to visit the soccer-crazy city of Kolkata in September ahead of the FIFA Under-17 World Cup being hosted by India. The Argentine superstar will participate in a charity football match against Kolkata’s greatest cricket export and former Indian captain Sourav Ganguly, the event promoters told AFP. Maradona—who was given a hero’s welcome when he first visited the eastern Indian city in 2008 -- will also be presented with a lifetime achievement award in West Bengal state. “It is such an honour for me to be able to make this trip. Kolkata is a very special place and I have good memories from my trip there many years ago, the fans were fantastic,” Maradona posted on his Facebook page. Football is hugely popular in Kolkata, with fans closely following international matches, despite India’s dominant obsession with cricket. The city has also hosted Brazilian great Pele, who last visited in 2015. Maradona’s visit is expected to build enthusiasm for the U-17 World Cup, which India is hosting for the first time this October.